Well, it's been a while since I actually picked up a brush and really dug into something. I've made a few attempts to get back into painting again without really following through and I don't really believe in doing anything half way, so I stopped and put it off. 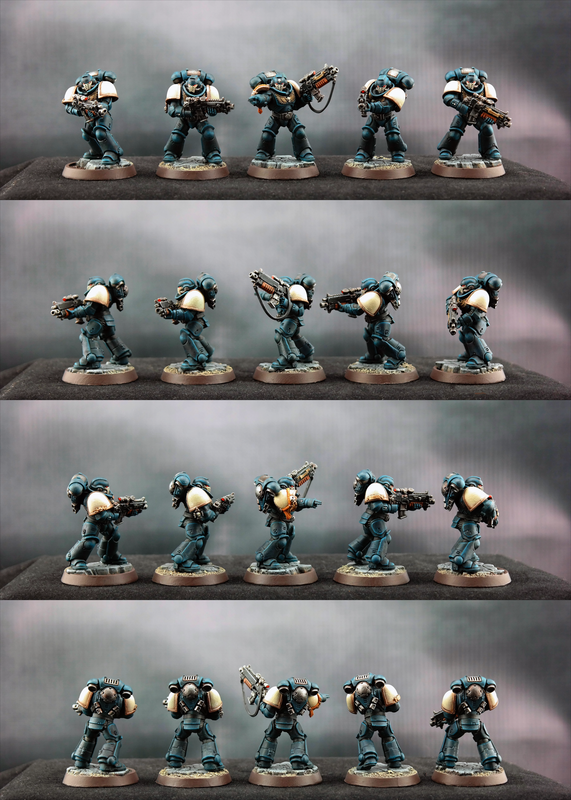 About a month ago, I started listening to the Horus Heresy books on audio and found the Alpha Legion pretty amusing...which I then combined with a test scheme I tossed up on reddit and got a good response on. Then the desire to paint again hit me and I've been trying to spend time every day painting, which has actually been great for lowering my stress so all the better. I'm still putting the fluff together into a presentable format but if you've read The Serpent Beneath then you'll get an idea of how Captain Asclepius is able to run the chapter without direct oversight from Omegon. Honestly, I'm being intentionally vague here because while it's not necessarily a spoiler, the concept is pretty awesome when you stop to consider it and I don't want to ruin it for anyone. My intent is to use Primaris marines in conjunction with Scions to represent human agents working with the Azure Serpents, keeping with the Alpha Legion's tradition of utilizing human specialists. I will not be fielding any characters that would be intrinsically against working with the Alpha Legion, I'm just stubborn that way even if it puts me at a disadvantage on the table. 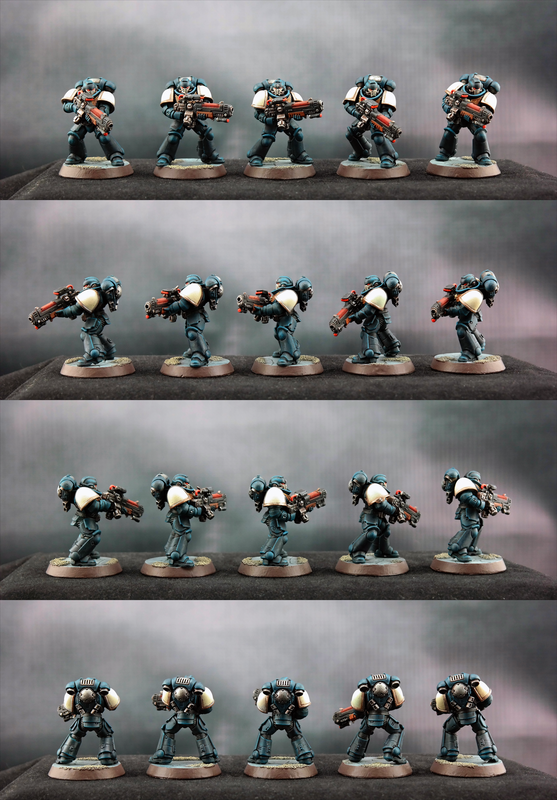 I will most likely be using the Raven Guard tactics from the Space Marine codex as it fits best with the Alpha Legion's style of combat. C+C is always welcome, as in my previous WIP threads, I really enjoy interacting and integrating feedback into future models that I paint. Also, I'm very open about the combination of paints I use to achieve different looks so please don't hesitate to ask and I will do my best to provide steps that will reproduce the look! I'm currently finishing my first Aggressor squad as well, I will hopefully have it update into the thread in a day or so, and I need to assemble the Repulsor tank that I got in the mail the other day too. Alright, enough talking, now for the pictures! Not super high quality or detailed, but simplistic and I love it. These are beautifully and simply well painted. I also love how the red of the plasma is so different from the others, it doesn't jump out at you like the blue plasma in every other model you see and it blends in well with your chapter's colour scheme. Plus it has that shotgun/flamer esq feel with the colour of the underhand grip and the red dot you've painted on the gun. My only critique is that I'd like to see more blue and less black for the legs, because the backpack is mostly blue and very little black. With the way you've currently done it, it looks and feels out of sync. When I mean it's too black, the blue is much too dark. Especially in the area of the shins. But please keep up the great work, because I feel want to see this project expand to an entire company! Good job on the models. By the blank pauldrons, may I assume you've yet to choose a Chapter symbol? If so, may I suggest a modified Iron Snakes symbol? Thanks for the feedback! I tend to maintain specific colors in my schemes that can be used across the entire force so that, while alone they might not stand out, when viewed all together they look like an actual coordinated force. If you look in my signature you will find links to my Solar Auxilia army and my Air Cavalry Scion/Astra Militarum army as well. As to black on the legs...there is actually' no black in the armor at all, what you're seeing is in fact dark blue/green there. The armor look I came up with was just a result of me playing around with some colors trying to get a feel for what works well on Astartes, as I've always done Imperial Guard/Standard human forces in the past. 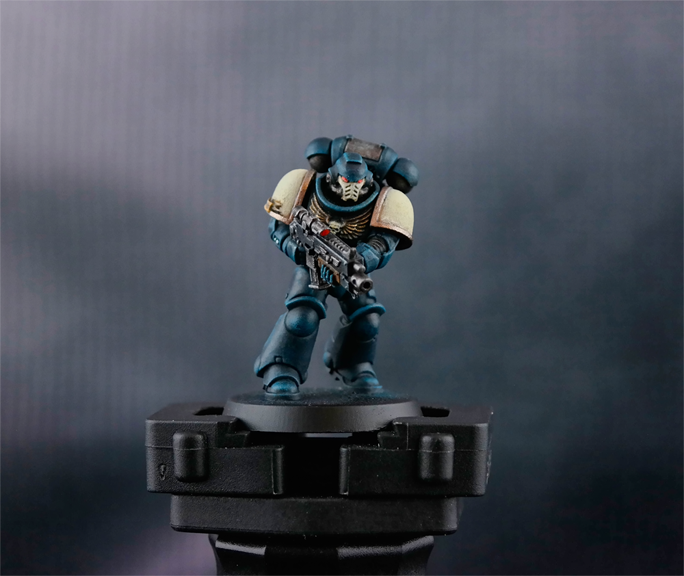 Here's a shot of the Aggressor I have done taken at my paint desk and not in the photo tent with a lot of direct light on it, might make the colors show better. Edited by Audemus, 13 July 2018 - 12:33 AM. I checked on the Iron Snake badge and that is actually pretty close to what I was looking at doing. Very cool concept, legit looking execution. I look forward to seeing how it develops. As applies chapter badge ... one possibiity which I've considerd for a not entirely dissimilar project , waas simply leaving the shoulder pauldrons 'blank', except as applies honorofics ands uch. As these are loyalists, who do they claim as their Primarch, to avoid suspicion? Guilliman? Corax? Manus, with the claim the serpent in their Chapter symbol is an artistic interpretation of Asirnoth?